Save 28% on multi-Award-winning AKG Y50 budget headphones today | What Hi-Fi? 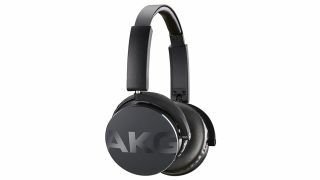 The multi-Award-winning AKG Y50 wired on-ear headphones are just £49.95 today, down from their normal price of £69.95. The offer is one of Amazon UK's Deals of the Day, so it will only run until midnight. These AKG's have won our prestigious What Hi-Fi? 'Product of the Year' Award for five years on the trot, so even without a discount they're a stellar buy. These AKGs are a touch on the quiet side – if you like things loud, turning up your device’s volume will drain its battery quicker than usual – but that aside, these are faultless budget headphones. The leather earpads sit firmly on the ears, the stainless-steel headband is durable, and portability isn’t an issue thanks to a neatly designed mechanism that lets them fold flat and collapse inwards for easy storage. Their clear, rhythmic and detailed sound performance is unquestionably the highlight, however, having not been trumped by any pair of similar-priced rivals in the five years since their arrival.